A water moccasin around a limb. A brook with flecks of fool's gold. A vine dangling over the creek. Green moss on a stone. Corn snake in the culvert. Bare feet in the cold water. Old leather boots from Sears on bank. 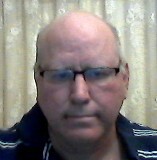 Danny P. Barbare has had work published in numerous online and print journals and is the author of two books. He lives with his family in Greenville, South Carolina, where he draws inspiration from the Blue Ridge mountains, and from the lowlands of Charleston. Great use of description/careful observation to set the scene. Beautiful scene. Love all the details. Ahh, thanks for the walk on this lovely autumn day.